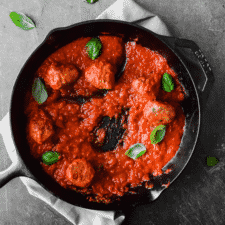 This is my favorite recipe for classic turkey meatballs in a skillet— perfectly spiced and hardly any work! Also Whole30 approved! It’s a regular occurrence that I get asked for everyday dinner recipes. The things I make for us. Because as much as I’d love to make an extravagant meal each night, it’s just not realistic. Here’s that meatball recipe that I gave you a sneak peak of a few weeks ago on my stories! It’s the meal that we gobbled down, just the 2 of us, in about 48 hours. No joke. THEY ARE THAT GOOD! These are total comfort food and one of our favorite meals. I like to make a double batch so we have them on hand during the week for leftovers. Toss them on a toasted hoagie roll, pair them with a big salad, pile them on top of spaghetti, or eat them plain with crusty bread. <– that one is my favorite. Now let’s talk about this sauce. It’s so simple. 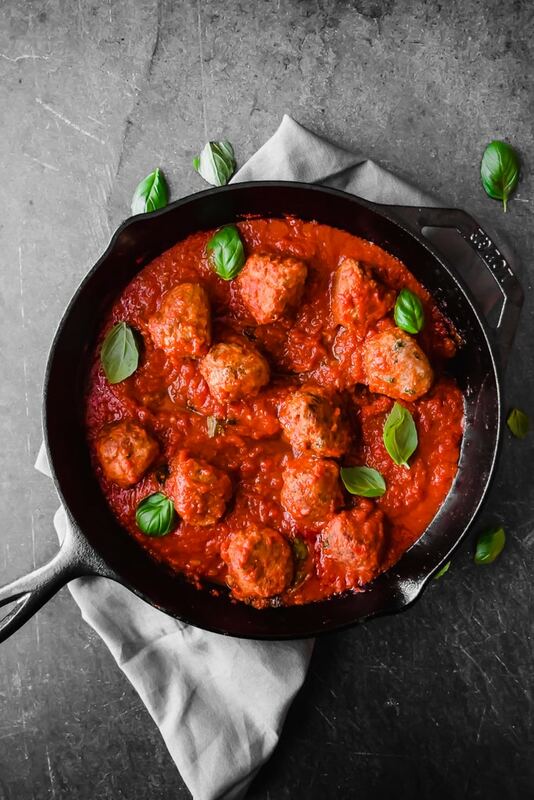 Since the meatballs pack so much flavor, all you need are some crushed tomatoes, fresh garlic, fresh basil, and salt. And it makes a TON of sauce for all your sauce lovers like myself. Dare I say it’s the best part? 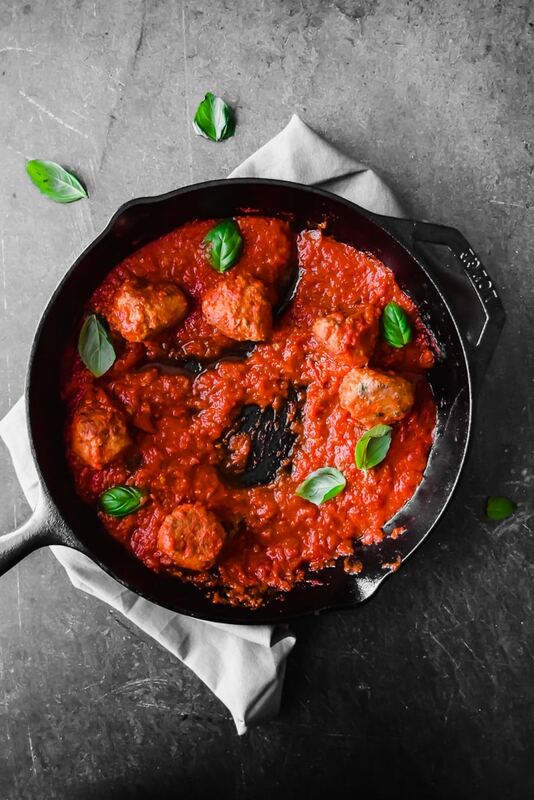 These skillet turkey meatballs are the answer to your busy, chaotic weekday and weekend life. PS: I’m making these again this week. This is my favorite recipe for classic turkey meatballs— perfectly spiced and hardly any work! Grab a large baking sheet. For easy clean up, line the baking sheet with foil. Set aside. Beat the egg in a large mixing bowl. Add the ground turkey, milk, almond flour, 1 Tablespoon olive oil, garlic, oregano, basil, parsley, 1 teaspoon salt, and pepper. Mix everything together so the ingredients are combined (the best kitchen tool for this is your hands!) — be careful not to overmix. Roll into desired size balls — mine were a little larger than a golfball. Place all the rolled meatballs onto the baking sheet. Coat a large non-stick skillet with the remaining olive oil — 1 Tablespoon per batch of meatballs, and bring to medium-high heat. Lightly brown the meatballs for about 1 minute on each side. Place the browned meatballs back onto the baking sheet. Reduce the heat to medium-low and add the crushed tomatoes, garlic, remaining salt, and fresh basil into the skillet. Let simmer for 5 minutes. Add the meatballs into the sauce and cover with a lid. Cook for 20 minutes or until the internal temperature of the meatballs reach 165°F. Serve with pasta, as meatball subs, plain, etc. Store leftovers covered in the refrigerator for up to 1 week. 1Make sure to use almond flour, not almond meal. 2Make ahead and/or freezing tip: Prepare the meatballs through step 3 and refrigerate for up to 1 day or freeze for up to 2 months in a sealed bag. Allow to thaw over night and continue at step 4. OR fully prepare and freeze cooked meatballs in sauce for up to 2 months. Defrost before reheating. Previous Post: « Park Bench Workout. These look amazing! I am subscribing too. Looks like you have great recipes for my very active family! Ditto on Nonna’s meatballs – I grew up with them. BUT they aren’t the healthiest. I still make them during the holidays but these are my go-to year round. Let me know what you think! These look amazing! I am adding this to our week meal plan! Nice photos too! Thank you! Let me know what you think of them!